Bonjour from Austin, Texas, where the second full day of summer finds us wondering how many more days until fall, and will it rain again before then? The answers are “too many” and “sweet baby Jesus I hope so”. Until then, we spend most of our daylight hours inside, venturing out only mornings and evenings, which are cooler but still make our sports bras and Nike shorts stick to us like cling wrap. And by “we” and “us” I mean “I” and “me”- not sure why I am gravitating toward the third person today. My house is currently redolent with the sweet smell of the double batch of granola I just removed from the oven. This is my go-to granola, and I have gifted some of you with your very own portion, casting me forever in your good graces. I will be bringing this crunchy Nirvana In A Jar to friends who are hosting us on our Colorado road trip next month. If this moves you to invite us to stop by your mountain retreat, feel free to leave a comment below. Or you can make your own, but that’s not as much fun for me. 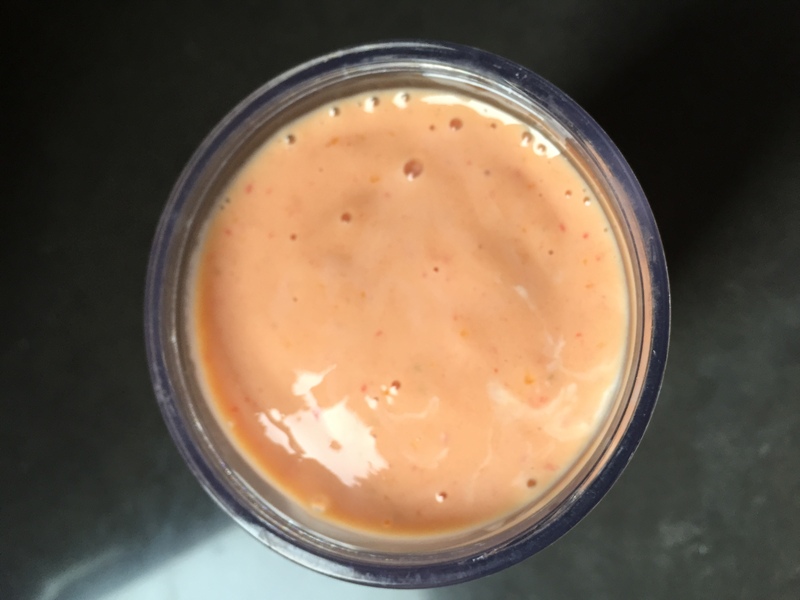 Can you guess what this lovely concoction is? This, mes amis, is the beginnings of lavender and honey ice cream! My good friend and I went to the Lavender Festival in Blanco, Texas the other weekend, and I bought a jar of cooking lavender specifically so I could attempt this ice cream. When we ate at Chicon recently, one lucky person at our table ordered lavender and honey ice cream, to which I sneered and opted for the coconut cake, because who wouldn’t? The ice cream turned out to be the clear winner over the cake, which was the only weak link in a delicious meal, and I have been thinking about that ice cream ever since. I used this recipe, but with one cup of cream and two cups of whole milk and a tad less honey. The loose lavender is strained out of the batter after steeping for ten minutes, so you do not end up with purple bits in your teeth after dessert. But it would be worth it, even if you did. We liked it with a sprinkle of that heretofore mentioned granola (did you know I was a lawyer in my previous life?) because the granola makes everything better. I think you can buy culinary lavender at Whole Foods, in case you happened to have missed the Blanco festival this year. I didn’t ride this to Blanco, but someone did. Lest you think Lavender Festivals are for sissies. It hasn’t all been lavender and unicorns around here. We moved all our stuff that had been in storage from Paris into the rooms not being renovated in our new house. Fortunately, everything appeared to be in as good shape as it was the day it flew out the window of our Paris apartment almost a year ago. Those Frenchies know how to pack. We also moved out of our Houston home and have stuffed boxes and belongings into our lake house until it is groaning with the strain. But whew. Glad the heavy work is done and that our treasures weathered the sea passage and storage. What else? I finally finished Queen Of The Night, a delightful tome by Alexander Chee. I loved all six-hundred pages of this story about a star soprano of the Paris opera who discovers that someone has written a novel of her life, including secrets that few people know. As she tries to figure out who the author is, she tells us of her amazing life as a circus performer, a courtesan, an assistant to the Empress, and a starving orphan. This book was enchanting from beginning to end. 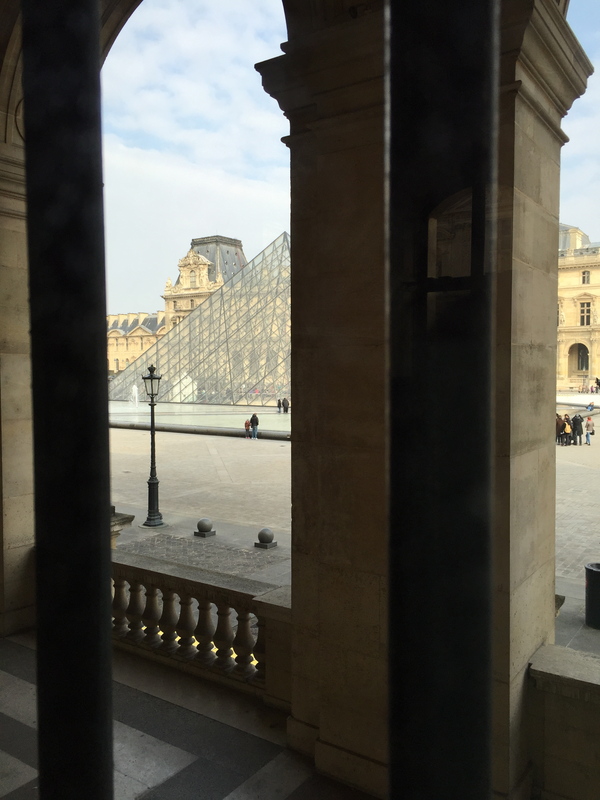 And did I mention Paris? We had Martha all to ourselves for Father’s Day, which we ended with a nice dinner with a view. Cheers to dads and sunsets everywhere. Bonjour from my new “office”, and by “office” I mean the porch of my lake house, now offering a view of a very full Lake Travis, which is a most beautiful thing. Hallelujah. Lots going on in these parts. 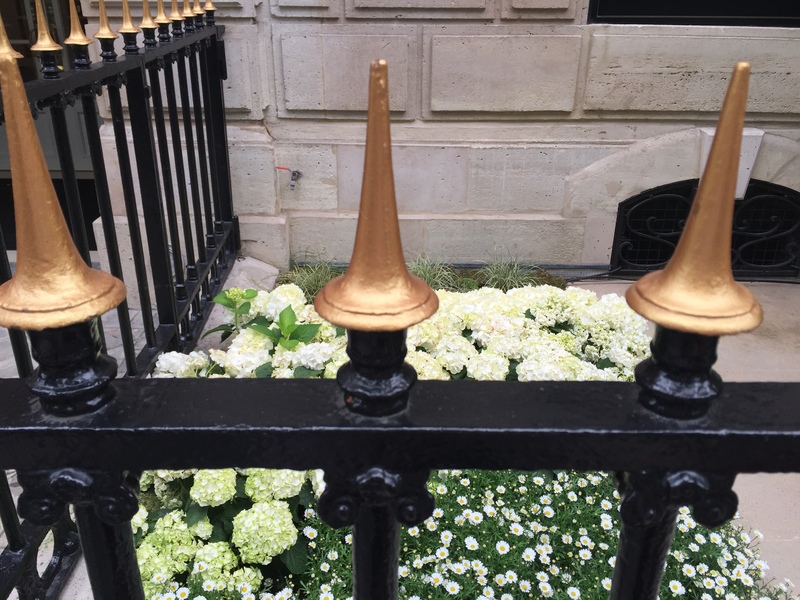 Spring has been sassy, bringing bounteous rain, flowers, and unexpected cool snaps. Although many folks around here are weary of the rain, we can’t help but be grateful for every drop, and hopeful that it doesn’t disappear again. Tomorrow we move all of our stuff from Paris into our new Austin house, even though a large part of that house looks like this. After ten months, we want to get our things out of storage, even if it means cramming all the boxes and cartons into bedrooms and studies and moving it around again when we finish this project (which could be a glimpse into eternity). So that’s my day tomorrow. You? Later in the week we make one last trip to our Houston townhouse, which we will pack up and vacate next Monday. It will be strange to no longer have a Houston landing spot after so many years. Fortunately we have friends and family there who will offer us beds occasionally. Right? Hello??? Mark and I have been exploring the Austin restaurant scene, which like many other parts of Austin is totally different from when we lived here in the early 2000’s. We are keeping lists of places we have gone and places we want to try, and both lists are getting longer each week. We have already learned that reservations and/or off-peak dining times are crucial at all of the trending eateries. Even with advance planning, the search for parking places at many cool spots can mean that you walk into the restaurant in dire need of a house cocktail STAT. But if you make your reservation well in advance and get lucky on a parking spot, you are likely to enjoy many a fine meal in Austin, Texas. True Food is one such place. Turns out there is one in Houston (and other places), but we never discovered it. The Austin location is in a corner of downtown that is being redeveloped and still feels a bit awkward, but no doubt will blossom into something lovely in no time. The interior was sleek and handsome, but all those shiny hard surfaces meant lots of noise bouncing around. We scored a table on the patio that suited us fine. My favorite dish of the evening was the Mushroom Lettuce Cups. Bonkers good, and not something I would be tempted to make at home. Something I have been cooking lots of at home is this Roasted Broccoli. There are endless variations on this theme and all are quick and easy. I make a bit batch, and what we don’t eat that night gets gobbled up on salads or on rice or grains later in the week. Trust me- you will never let your broccoli near the microwave again. Mark and I loved watching a six-episode show called The Night Manager on Apple TV. Lots of glamour, hard-bodies, and gorgeous European locations. And with only six episodes, you don’t have to commit to a long-term relationship. Yea. That’s all for now, friends. Thanks for keeping me in your radar. I’ll be back. Just like the fruit flies I finally got rid of in my kitchen this weekend. 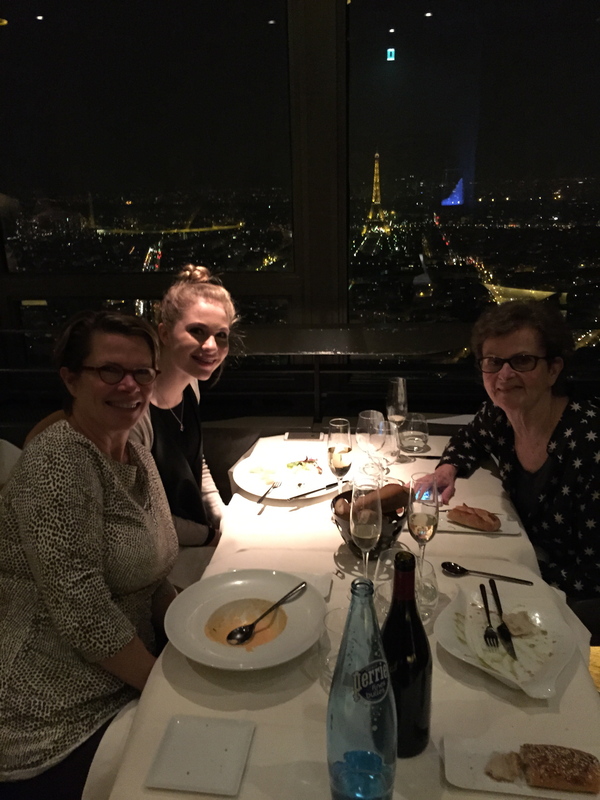 Mom and my niece were only here for a week, but we made sure we filled each day with as much Paris pleasure as we could pack in. 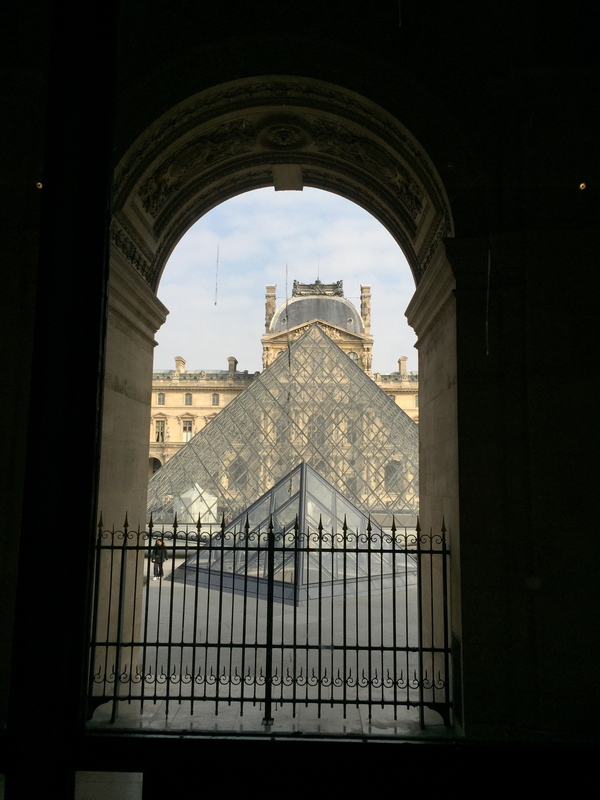 Obviously, my niece could not make her first trip to Paris and not see a bit of the Louvre. 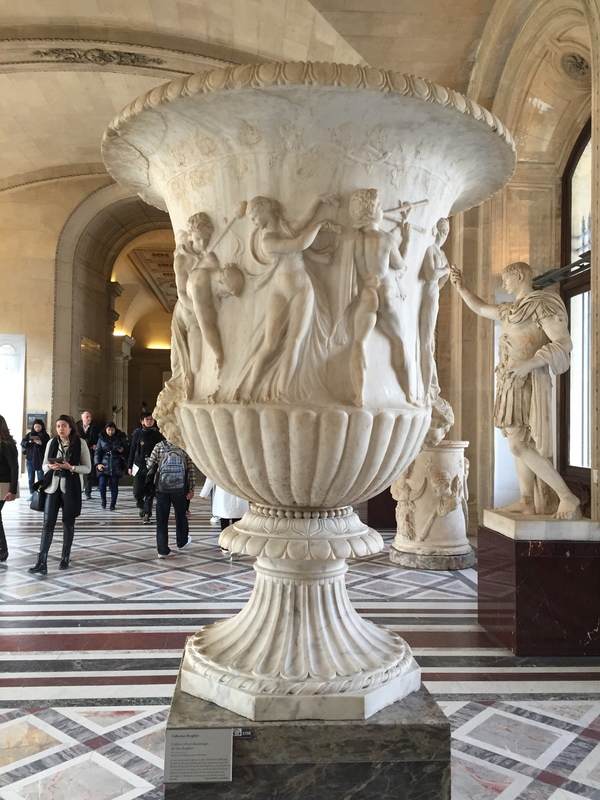 We walked over one morning, hoping to beat the crowds, and did the “Masterpiece Tour” on the museum’s very cool audio guide. The guide had a screen with a GPS on it that showed where we were and guided us to the “top hits” of the collection. As we approached each masterpiece, the audio would begin telling us about it without the need to push any buttons. Way cool. Despite some technical difficulties, which may or may not have been due to user error, we found the guide to be very helpful and I would highly recommend renting it. We spent about an hour and half there, which was just about all we could manage. Aren’t you glad I opted not to video my tour, as many others were doing that day? 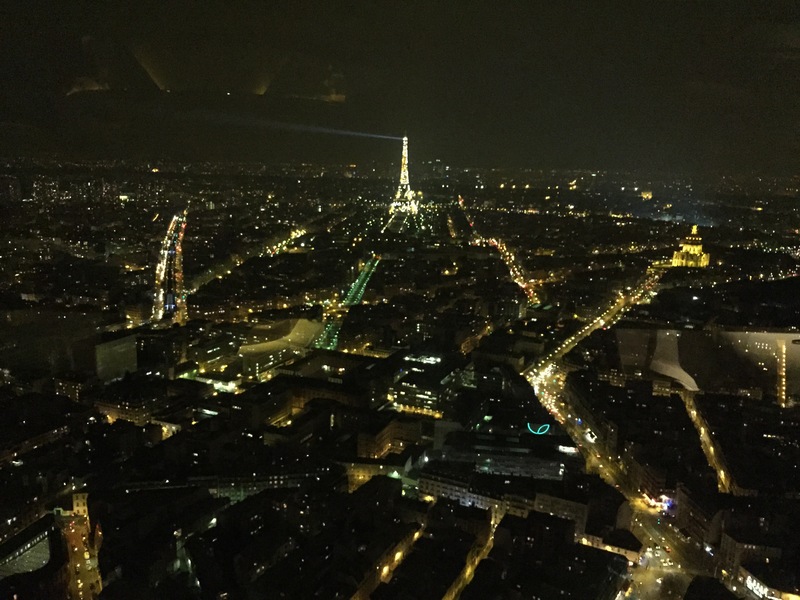 Having experienced a tip-top view of Paris by day, we decided to try a night-time view from the restaurant at the top of the Montparnasse tower, Le Ciel de Paris. Mark and I had never been up there and were curious about the restaurant and bar with a view that included the Eiffel Tower. I must say that my expectations were exceeded by our dinner experience. 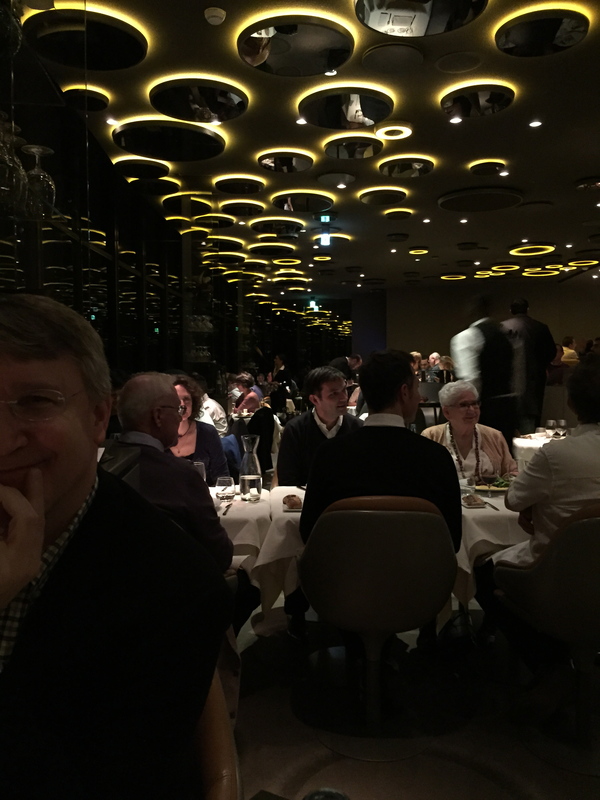 The service was professional and friendly, the atmosphere was elegant, the food was good, and the view was prime. 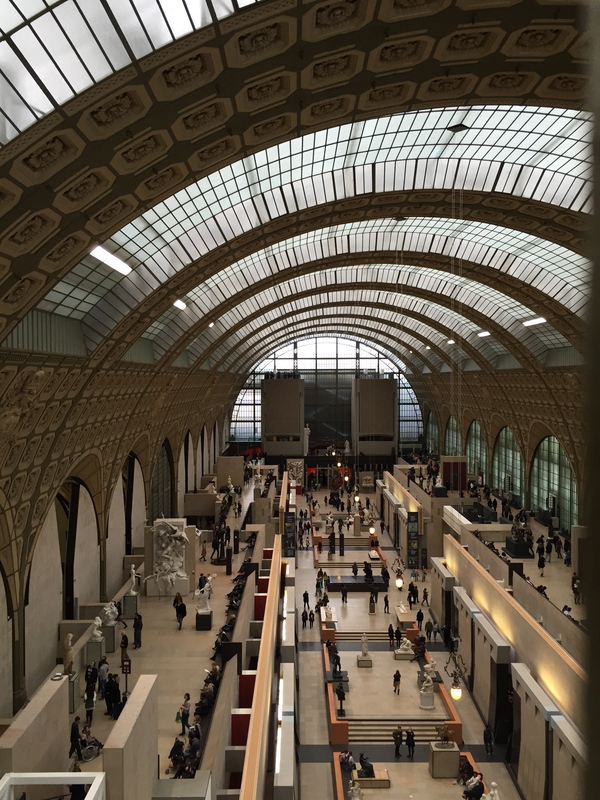 I was thrilled that my niece was actually interested in art, so I didn’t pass up the opportunity to show her one of my favorite museums, the Musée d’Orsay. We toured the sure-to-please impressionist collection on the fifth floor, and then chose a few classics from the second floor. 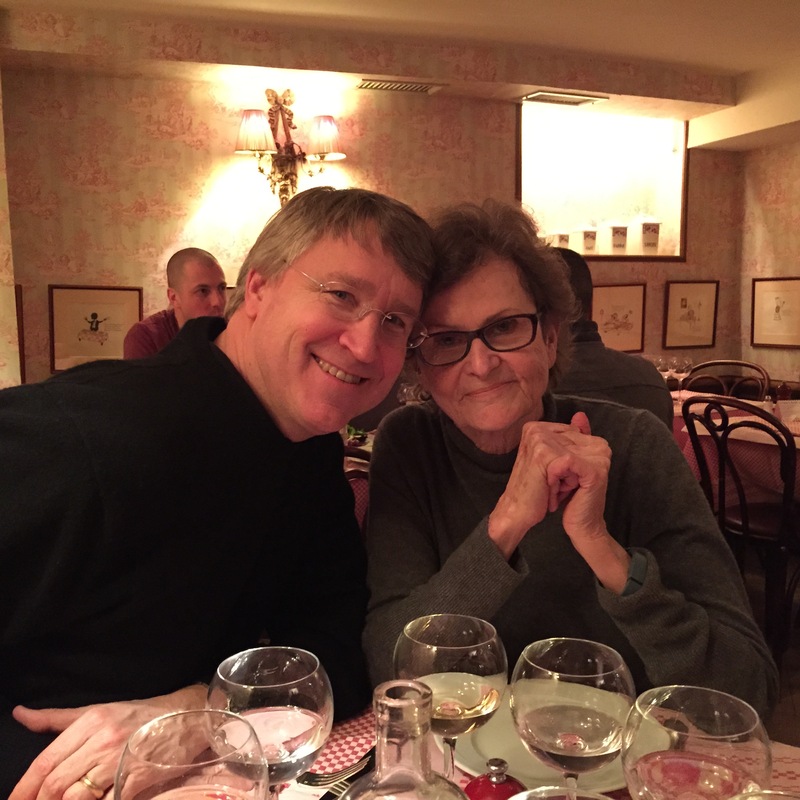 Their final night in Paris was a Sunday, and we took them to an old family favorite near the Eiffel Tower, La Fontaine de Mars. 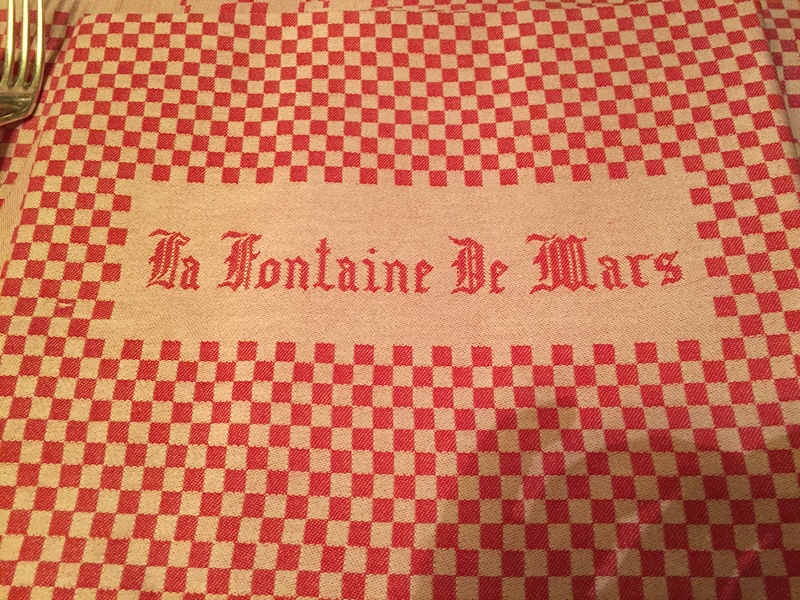 Not at all pricey, but always good, this place serves a delicious roasted chicken and mashed potatoes for when you have had all the fancy French food you can stand. And just like that, our week was over. Time always goes by too fast when we share Paris with family! On a more recent note, I went to the Wilson Market yesterday and came home with the last of the winter’s cauliflower and the first of the spring asparagus. I love it when seasons collide like they did in this tasty dish from Smitten Kitchen, Roasted Veggies With Brown Butter Breadcrumbs. 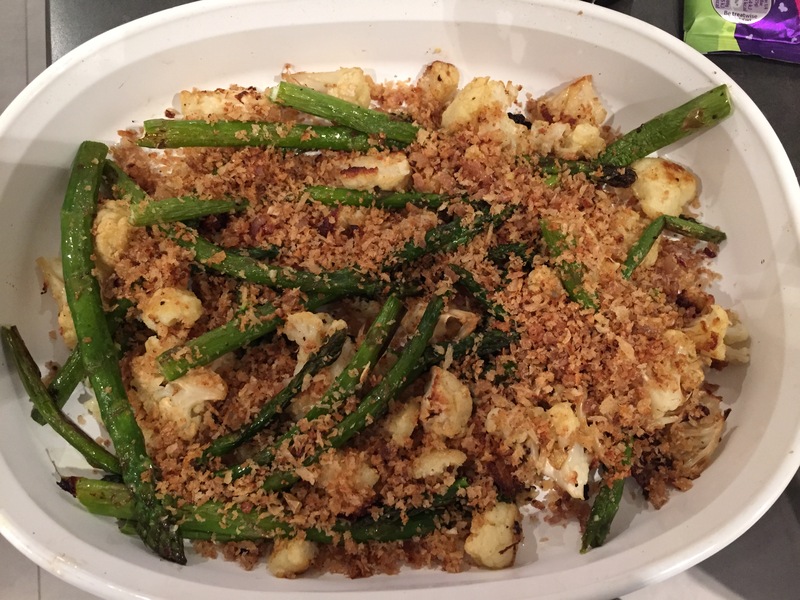 Actually, her recipe was just for cauliflower, but I knew it would be delicious with asparagus too, because, brown butter. I hope you are all enjoying this lovely season, wherever you may be. 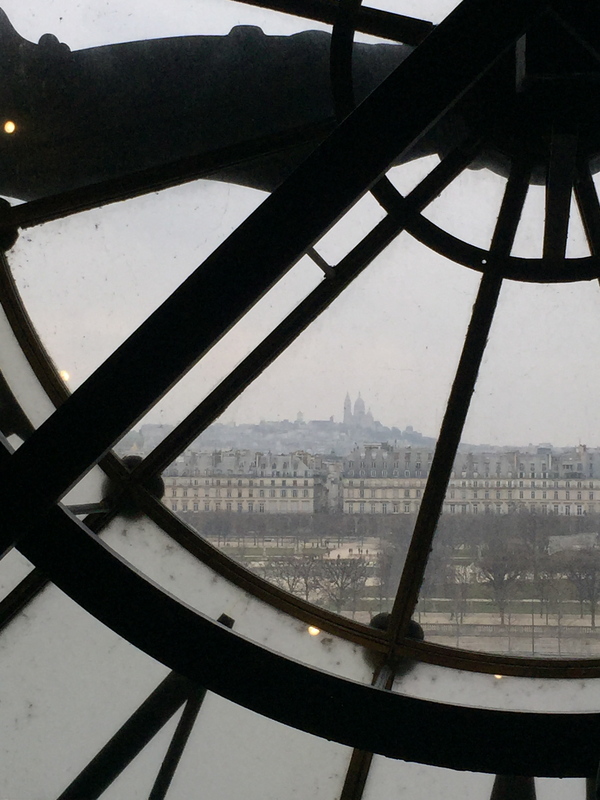 Spring is taking a time-out in Paris today, where it is grey and drizzly and a breezy 52 degrees. No worries, though- sounds like a perfect Sunday to stay inside, blog, and check out my new favorite Netflix show, The Unbreakable Kimmy Schmidt. Thanks for sharing part of your day with me! Mark left for a quick three-day trip to New York City today. That means that I can cook one big batch of something and eat it for the next few days, which is something I don’t mind doing but don’t force on my husband. It’s kind of lazy, I guess, but better than another possible alternative, which was to live on almonds, red wine, and butter (which I may or may not have considered when it was time to get out of my jammies and head to the market). Pictured are shallots, turnips, bread, celery root, carrots, lettuce, a parsnip (I hope), and a gorgeous piece of “pain noir”, bursting with seeds and nuts. She actually merits a close-up. You might ask why bought all that bread when it’s just me here, but then you would be rude. I roast veggies a lot, but this time I tried a new technique from America’s Test Kitchen that I read about here. It involved a few extra steps, like “par-microwaving” (is that even a thing?) the veggies, draining, and then adding to a hot sheet pan, but it resulted in a lovely, even caramelization in less time than these vegetables usually require. And my kitchen smelled amazing. So my plan is to eat these for the next several days, perhaps with some cooked grains or lentils, and definitely with some bread. 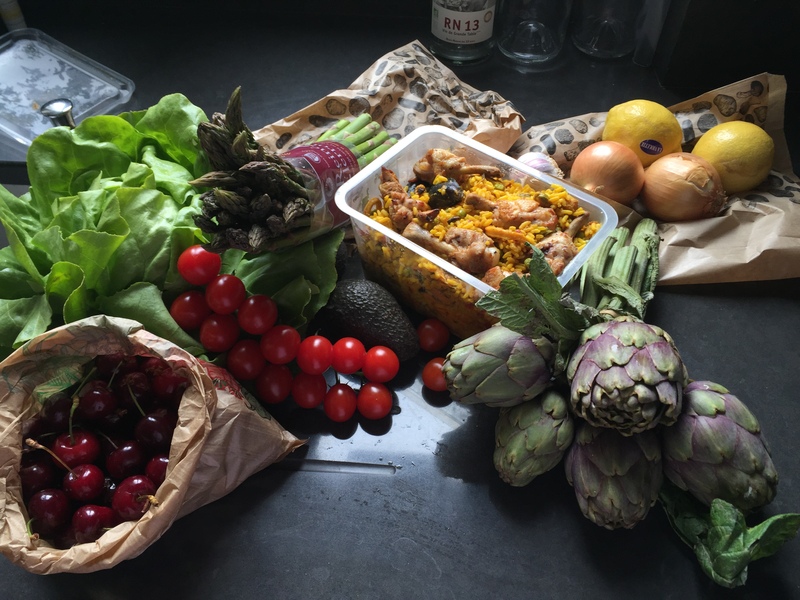 Now that my food is taken care of for the rest of the week, my only challenge will be resisting the call of my warm bed and the newly arrived French Netflix, which includes Orange Is The New Black and the British show, Call The Midwife. Yep- as much as I love tromping around Paris like a crazed woman, I also have a dark side that tempts me to stay inside and in my pajamas all day. I have been bingeing on Orange Is The New Black, and as much as I like it, I can only take so much of all those women in prison garb. In fact, this might be the perfect time to switch back over to Mad Men for a bit. Nothing goes better with winter vegetables than a side of Hamm.